Today was the day. Even the beginning of the new day agreed with me as we sailed through mile after mile of country-side. As the chartered bus drove smoothly onward, my anticipation of what awaited us grew with it, for we were about to visit Dominica's secret as it was called. Then, here it was sitting in its entire green and white splendour, beginning from the base of the hill, or was it a mountain? Inviting us into its outstretched arms. Occupying 4.5 acres of lush land situated between the small communities of Anse-Sol-Dat and Anse-De-Mai in the north of the island, is the 30 room, five executive suite, three swimming pools, equipped with a wellness spa, roof-top terrace and bar, restaurant and bar with a multi-million dollar view of the Atlantic Ocean, is the Atlantique view Resort and Spa. Atlantique View is fusion of European and contemporary style construction, merged with warm, yet soothing Caribbean themes. It is only 35 minutes' drive from the Melville Hall Airport, 15 minutes' drive from the town of Portsmouth, and one hour and fifteen minutes' drive from the city of Roseau and five minutes from the beach and other water ways; and a member of the Choice Hotel International's Ascend Hotel Collection®. In an interview with The Sun, General Manger Hazel Cadette said the aim of the resort is to exemplify the service "in which we operate and with the team that we have, we are able to do so". According to her, the resort is the newest secret on Dominica, and the newest secret that every-one should know and find out more about. She also mentioned that they are able to compete with almost all other properties on island and the Caribbean at large. "We are different, and when we say we are different, we mean different. The view you could enjoy here and the services that you would enjoy…surpasses everything that you would enjoy in Dominica," she explained. 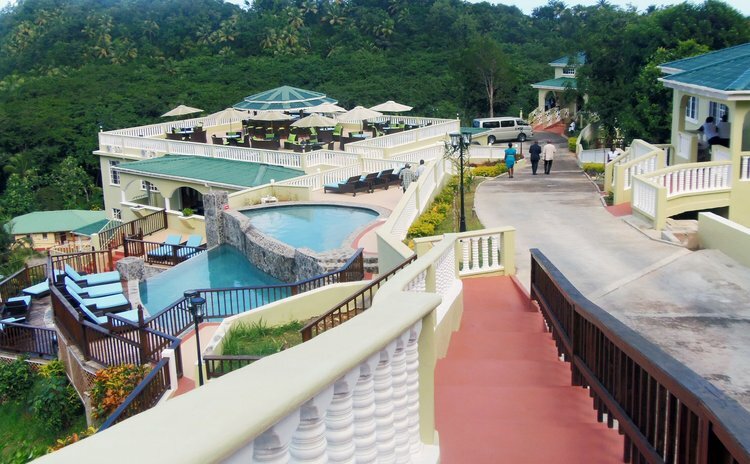 Cadette pointed out to the various rivers, falls and the sea which are all just a few minutes away, and boasted that they are the only resort where you could play basketball and tennis and enjoy three swimming pools. Other facilities include: a conference room and spa which are highly requested because of their secluded and peaceful setting. There was a soft-opening on November 8th and an official opening is planned for December 15. But as the saying goes, all things must come to an end that was the train of my thoughts, as we received the VIP treatment and tour; and a small taste of heavenly delights that we ate.